The Mitsitam Cafe at the National Museum of the American Indian is always an intriguing place to have a cafeteria-style lunch. Filled with many cuisines and traditions, from all across the Americas, its choices always hold promise. It’s been a few years since I last tried to eat there, and I was not disappointed with the Indian Taco from the Great Plains section. 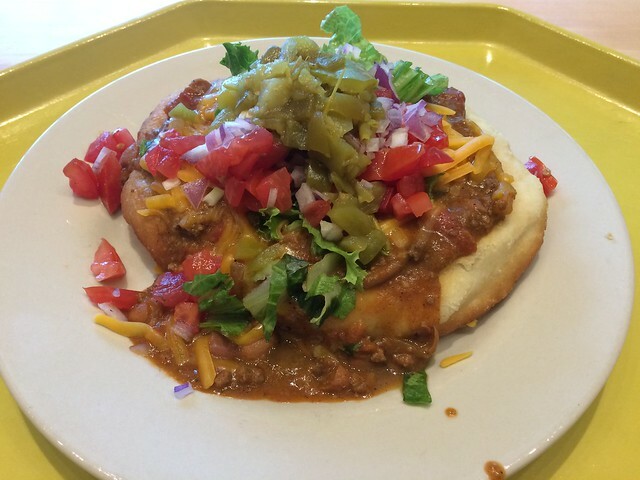 It boasts fry bread (good), smothered with their thick Bison chili, then piled high with lettuce, onions, tomatoes, cheese and green chilis. I was a little annoyed with the prices ($13), but then I realized that I can take advantage of all the Smithsonian Museums for free at any time I so choose. With that in mind, and the fact that DC is not cheap to begin with, I’m happy to contribute in some small way in return for a tasty taco.